Plot: Witty and self-absorbed Justin catches feelings and has to admit the world is bigger than himself. My thoughts: I don’t know the right way to describe the writing in this short story. I think of it as ‘poetic as hell.’ It’s gorgeous and lyrical. The format wasn’t my favorite but I’m glad I stuck it out because it’s a good quick read with witty dialogue and a sweet love story. Fave Part: I really enjoyed the prose, but the dialogue was good too. The conversations were a mix of how I actually talked in high school and how clever I wish I was in high school. Throw two characters together with absolutely nothing in common and force them to interact and you’ve got a classic rom-com. Why do opposites attract? Maybe it’s because love stories are more fun when things are a little complicated. Maybe it’s because two very different people can meet and become stronger together than they were on their own. Yes, it’s possible I was a Sterek shipper at some point. Whatever the reason, unlikely pairs with undeniable chemistry are fun to read about. These are some of the best opposites attract stories in YA fiction involving gay romances. Alek Khederian should have guessed something was wrong when his parents took him to a restaurant. Everyone knows that Armenians never eat out. Why bother, when their home cooking is far superior to anything “these Americans” could come up with? Between bouts of interrogating the waitress and criticizing the menu, Alek’s parents announce that he’ll be attending summer school in order to bring up his grades. Alek is sure this experience will be the perfect hellish end to his hellish freshmen year of high school. He never could’ve predicted that he’d meet someone like Ethan. Ethan is everything Alek wishes he were: confident, free-spirited, and irreverent. When Ethan gets Alek to cut school and go to a Rufus Wainwright concert in New York City’s Central Park, Alek embarks on his first adventure outside the confines of his suburban New Jersey existence. He can’t believe a guy this cool wants to be his friend. And before long, it seems like Ethan wants to be more than friends. Alek has never thought about having a boyfriend—he’s barely ever had a girlfriend—but maybe it’s time to think again. Michael Barakiva’s One Man Guy is a romantic, moving, laugh-out-loud-funny story about what happens when one person cracks open your world and helps you see everything—and, most of all, yourself–like you never have before. The story itself was very upbeat. I loved everything about the city (again, it was spot on with the attitude we get when we go into the city- we aren’t tourists, but we’re not New Yorkers). Plus, it was great to get a cute story that didn’t end with suicide or depression. I feel like a lot of LGBT books deal with those heavy topics, and while that is a very important issue, not all people face that. To have a book where the people are accepting is just nice to see. Benjamin is Amish, and cooling off in the swimming hole is one of the few liberties he and his brothers enjoy. A friendship with an English boy is not—but that doesn’t stop him and David from getting to know each other, as long as it’s on the neutral ground by the creek. After David risks his life to save Benjamin’s father, the boys’ friendship is tolerated, then accepted. But before long, Benjamin’s feelings for David grow beyond the platonic. Benjamin’s family and the rest of the community will never allow a love like that, and a secret this big can’t stay secret forever…. Love does not know cultural boundaries, thank God. Two young men meet and fall in love, beliefs are questioned, conflicts occur. Will love be strong enough? Read and find out in a touching story of discovery. There is no need for graphic details of love making, it is not necessary, the story carries well on it’s own. I think it is a great read for young and older adults as well. Hate is still alive and well in far too many lunch rooms. This is one of the better books I’ve read in the recent years that truly tackles these subjects. Immense in it’s realism on the subject matters it tackles, M.B. Mulhall deserves every award in the book for not taking the easy route on this. It’s gritty, and at times very hard to handle, but the way Mulhall crafts the story allows it to be the punch in the face it should be. Evan Granger, is adamantly effeminate and not about to hide it. He wants to grow up to be a drag queen. So rare is it that a YA novel really deals with the issue of a boy who simply cannot “pass” in a straight world… The book is about Evan’s agency, and it is surprisingly powerful. I found myself echoing his friends, “why can’t he just tone it down?” And then realizing that I, too, reflect the problem the book is trying to illuminate. It is Even’s refusal to back down that is at the core of this tale. Grade twelve is flying by like a pride parade of gay freedom and love until Skyler finds his gorgeous downtown boyfriend cheating on him over Christmas break. The breakup leaves him raw and not up to ignoring the usual gay taunts from soccer star Ryan and his teammates. Writing Style: Third person, POV alternating, vivid descriptions. 200 pages. 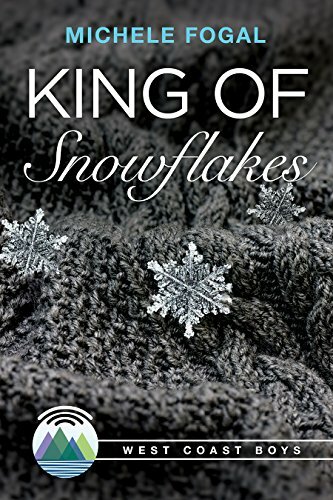 King of Snowflakes is a story that zeroes in to the heart of its characters and drags every secret out into the open. I loved it… KoS takes a very realistic view of sexuality, and takes an incredibly kind and mature approach to the idea of exploration and open communication. It was such a breath of fresh air to see these characters open up to each other and admit what they want and need. I definitely recommend King of Snowflakes for anyone who enjoys LGBT romance, it could make you feel warm inside in 10 feet of snow. Ok, this is a five star read because it appeals to the ooey-gooey, sappy center of me. It’s exceptionally talented teenagers-in-love who really, genuinely have a sweet relationship and they made me root for them the entire time. It’s the sort of book that makes me want to read a fluffy HEA sequel where they just keep being strong together and triumphing over obstacles. It’s a chicken-soup comfort read sort of warm fuzzy book. Under the Stars is a sweet gay teen romance and coming of age tale about two high school boys who meet at a remote dude ranch – one a guest and one a ranch hand… This is a solid entry in the gay YA coming of age library. While perhaps not as stellar or challenging as some other gay YA books, I found Under the Stars most enjoyable. If you enjoy gay coming of age fiction, you’ll enjoy this book. Many people are saying this book is aphobic, and I have to say that I couldn’t disagree more. I just finished this book today and found it to be powerful, evocative, and frankly quite good. Mark’s narration is simply addictive. A bit self deprecating (he is classified as a nerd), sometimes funny but totally honest and all heart… I like that Bill is not the typical jock character depicted in most similar stories and the nerd is not the one in need of help here. Bill is the victim and his rescue is the best part of the story. Jeff Irwin is short, timid, and studious. A bit of a social outcast, he lives quietly in the shadows of the popular kids at his school, his life ruled by his ever-present fear of rejection or failure. Enter high school football hero Brett Willson and the chance for Jeff to embark upon the challenge of educating the world’s dumbest jock. But what develops between Brett and Jeff proves far more challenging than any tutoring session. In 1983, rural Michigan isn’t ready to embrace love between two men, never mind two teenage boys. If they’re going to make a go of it, Jeff will have to come out of his shell—and Brett will have to prove he’s more than just a dumb jock. Despite some qualms about the nature of Brett and Jeff’s relationship, the core of the story touched me very deeply. It was written from the heart. I liked seeing Jeff come into his own and working him way through some pretty deep issues – not just the typical teenager issues, but with his family. And darn it, I liked that epilogue. Have you read any of these? Tell me what you thought! Are there any other opposites attract stories I should check out? Under the Stars is one book I’m currently giving away, along with several others. You can click on the banner to go to the contest page.